"It's not like putting up wallpaper you know"
The end of August came and went. Still no builder on site, still no windows ordered. The goalposts were being moved and it started to feel like any semblance of control we had was slipping. That sounds overly dramatic BUT in this case it was a lot of wasted time. I dreaded the questions, “any news on the house”, “how’s the house going” “are you in yet?”, everyone excited to see how we were getting on. The next commencement date was moved to the start of November and we were really losing patience. It was costing us money now, bills were doubled between our rental and the Mews and we were no closer to moving in. On a few occasions, we had quite fraught meetings. One particular occasion I'm still seething from (!) was when I wanted to see what options there were for laying zinc on the roof of the new extension. I liked the idea of changing the width of the strips or even potentially laying it at an angle, my natural compulsion to push beyond the obvious and to try to look at things differently. The response I got was that it was just laid a certain way followed by “Its not like putting up wallpaper you know”. One word. Rhymes with hob. The windows were still in limbo and we were struggling to come to terms with the cost of lime-plastering the walls. 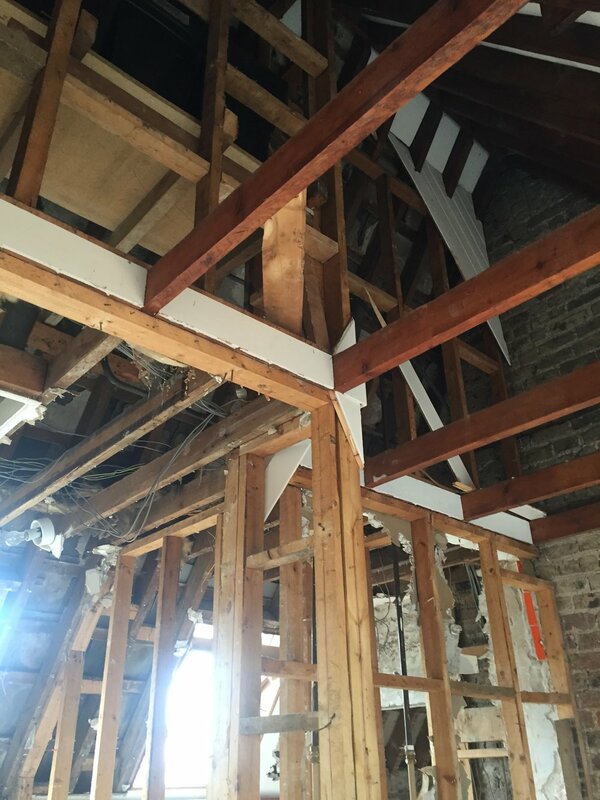 There wasn’t much choice though as old buildings need a certain breathable type of plasterboard which was working out more expensive than lime rendering and we needed both the external and internal walls done. Another curveball came with the roof; while we initially believed it didn’t need to be changed for a good few years yet, once the guys had access from the scaffolding they recommended that it would need to be re-roofed sooner rather than later and we would possibly get another 4/5 years max before we’d have to do it. I hate these decisions, you know it's the right thing to do, it makes 100% sense to do it, but it’s another extra that we hadn’t bargained for. Brian and the team from Rainey Restoration, finally started on the first week of November. It’s a long process and they recently finished in early March, some four months later. Their work is a craft; painstakingly meticulous, I have huge respect for what they do. I loved seeing the repaired walls but the most exciting thing for me, was an actual design decision at last, an ope for a new door, FINALLY a nicety and not a necessity. The bull-barn, aka bit of a shed at the side, maybe from now on we'll call it ‘the extension’… was the one part of the building we had permission to make changes to. 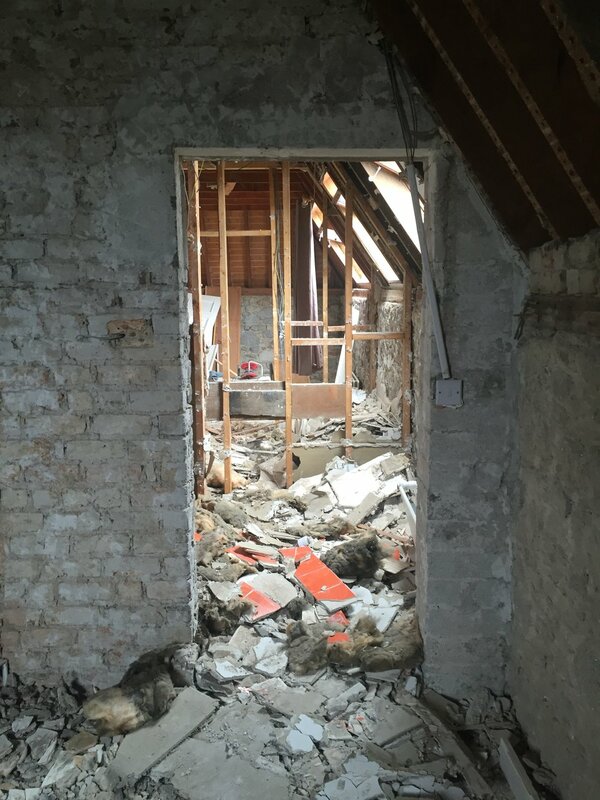 We are swapping around the original kitchen with the sitting room, my thinking behind this is to integrate the new extended area with the kitchen and create an extra eating area opening onto the courtyard. This also gives us additional space for utilities and a downstairs WC and shower which in turn allows us to combine the two en-suites upstairs to create a single, more substantial bathroom. The new doorway opening through the wall is just great, so well-finished, such a small thing, but already the room looks much bigger and the extension has more purpose. We also opened a closed arch over the original bull-barn door. It wouldn’t have worked any other way because it was too low to walk through, but boy does it make a difference. If I may say so, it was a damn good bloody call! "Please Patron Saint of moving buildings along, can things start to take shape soon?" SPOILER ALERT: things do improve. CONFESSION ALERT: that is a bit of a lie as I'm up-to-date in the story. BLOG ALERT: this blog will get better. The tender process is difficult. I know only too well, I’ve been on both sides of tenders in my job. For the builder, they have to put a lot of time and effort into pricing a document, without knowing if they will get the job. There is pressure to ensure that every element is accounted for without leaving anything short, being careful not to overprice either and to bear in mind that the client will hang on every line and digit of those figures. From a client’s perspective, they want all the details to be able to work out what they can afford and the best way of getting it. It can take quite a few weeks to finalise everything so that both sides are in agreement before starting the work. The contractor we were working with came highly recommended. The house had been idle since purchased in November, and we were really keen to tie all ends down so we’d be ready to start work by the end of July when the planning permission came through. Our first hurdle came when the builder said he couldn’t start till the end of August. It was disappointing but hey these things happen, and for me I was trying to stay calm about things in my life and there was nothing that could be done about it except wait. The one thing we could do was get the site cleared in the mean-time. All the damp plaster came down exposing beautiful, original stone and granite sills. Fan heaters were left to dry out the dampness in preparation for lime-rendering the stone walls. The kitchen and bathrooms were disposed of and the floor boards were pulled up to reveal cobble stones but no foundation (not so beautiful!). The ceilings were taken down so we could assess the leaking roof and see what level of repair it needed. Although we were left with a mere shell of a building, we were now making some progress and I had been dying to rip everything out from the day we got our hands on it, so this was great. As much as I had a definite vision for how the house would look; being listed, the style of building really dictated what we could do and there wasn’t room to make any significant changes especially to the outside. In the background, the windows were still not agreed on. From the outset, we really wanted thin profile steel windows. Add in the desire for thin profile steel windows with a thermal break and a few custom arches; and its not mission impossible, its mission bloody expensive. Above all the ideas we had, I really didn’t want to give up on the steel windows. For a small building, there are quite a few windows and the building deserves to be done properly. However the budget was getting tight and we were already really crunching numbers. We had till the end of August to get this right, decide on where we were getting them from and build into the schedule the lead time for getting them made. We first saw it in about July 2015, it was different to all the others, I even thought it was love at first sight. The seller wanted a 100% guaranteed buyer. We had looked around at quite a few houses but there were definite criteria, same as any potential buyer, but this was my fourth house, I knew what I wanted. A sunny garden for a wannabe gardener, ideally detached, thin walls are a no-no, we couldn't actually have got much thicker if we tried and off the road was very important. I didn't mind a do-er upper; in fact buying someone else's style for me is a waste of money as its a given I’d want to make considerable changes, so we were always better off buying a house that needed work and not paying extra for what I would immediately undo. The house seemed ideal— an architect and engineer had said it was structurally sound, we’d get away with the roof for another few years and apart from requiring a serious amount of insulation, the house was a good buy. That was all we needed to hear, job done, house in the bag, open the champers. Plans were drawn up and planning permission got underway in February 2016. This took a little longer than normal as the building was listed so we had to ensure all the T’s were crossed to hopefully ensure a favourable result. During the waiting period we really wanted to have our homework done, the biggie was to have the windows chosen, these are a huge part of the style of the house, an integral part of the overall design. It's a small house, there are two decent sized bedrooms and two downstairs rooms. The front door opens to a small hallway and stairs that connects the bedrooms to downstairs. The kitchen was relatively new, but we wanted to swap the kitchen and sitting room around so the kitchen was passed on. The bullbarn (recently referred to by a trades guy as the bit of a shed on the side, — hey Mr, thats our new extension) — was crying out to be incorporated into the rest of the house. The original floorplan had a downstairs toilet but it shortened the hall and restricted the area for a new stairs, so this had to go. Upstairs two ensuite bathrooms off the bedrooms had an original ’70’s feel, I couldn’t wait to fire them out. At the back, there is a small courtyard off the bullbarn that faces the main house. 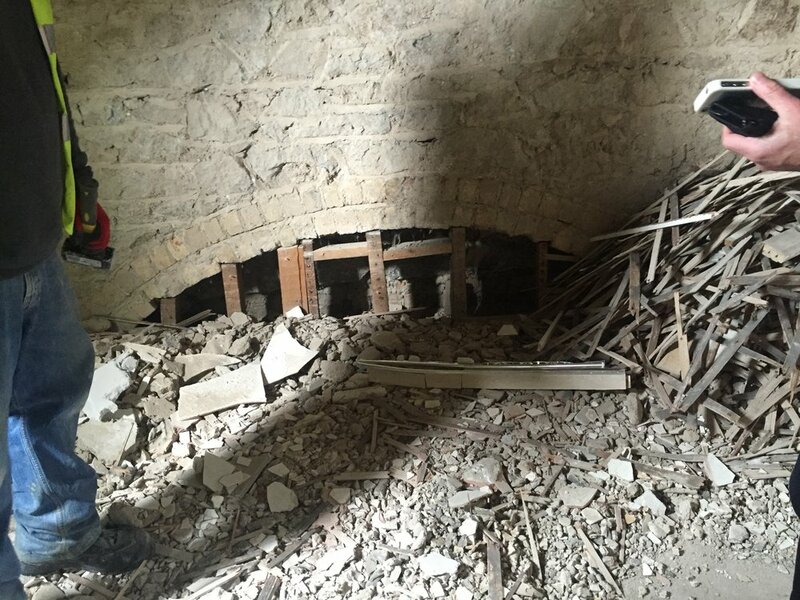 This would have been the original front of the house or the front of the horses house — yep it appears we bought an outbuilding and under the floor boards sitting on adamantine stable paving bricks found some original horse sh*t to prove it! I havent been to Blackrock Market in ages but yesterday decided to go on a little jolly with Mr H. to see what treasures I might find. It seems to have a good few more stalls than the last time I was there which is great for a right old mooch. There is a super stall for dog lovers called The Hound Club Emporium, www.facebook.com/HoundClub — fab leads and collar in bright shades that R&B will be sporting soon for their Spring attire. Then I came across this great shop 'Art Earth' selling the most amazing baskets at really reasonable prices... use them as display, to carry groceries, as a basket for logs, a clothes basket... endless possibilities! Another cool store Bella selling pre-owned designer clothes is worth popping into among the quirky stalls and nick-nacks that you never know what you're going to find. Bargain of the day was my woven basket but followed closely by an old rope ladder from a ship. These one-off pieces are — well just that — intriguing objects and one-of a kind wares that personalise your space with character and detail. We finished off the day with a coffee in the BEAR Market. I love this spot... they do a great coffee and the overall design and graphics really inspires me everytime I go there. A perfect lazy Sunday afteroon. If you haven't yet come across design by the guys down under and love seemingly casual but beautiful design, then Australian interiors is really worth checking out. These guys really know how to create easy-going, relaxed but so well considered homes. I get really inspired by trawling Instagram and Pinterest or flicking through my collection books. It's like a visual feast of goodness to get you fired up with new ideas and plans, just like Rocky on fight night. My hands down, no question, 100% all time favourite is Sibella Court — for her rough-luxe approach to interiors, beautiful styling, rich photography (her own and her brothers Chris) — images that make you want to dive into her books and sit on one of those chairs — clearly it's a serious girl crush. Buy every single one of her books and you wont be disappointed. If you are a graphic designer you'll really love them too for their design, typesetting, colours, choice of paper, print effects, the whole friggin' lot - "Nomad", "Gypsy", "Etcetera", "Bowerbird" and a great one if you're looking to hangout beyond the main drag in NY — "The Stylist Guide to NYC". They are my dog-eared design bibles! She has also recently put her pad up on AirB&B. Check this out for the ultimate in coolness! A great daily fix is the Design Files, a brilliant blog that focuses on Australian creatives from across the board — there is always something to read up on, with great pics and some nice recipes in there too so well worth subscribing to. Two more that I really like are stylists, Stephanie Somebody, could you possibly see much nicer work? — and travelling adventurer Kara Rosenlund. Check out some of her blog and her prints. Think this one would fit nicely in my animal-loving pad! Get a sniff of Four&Sons, (R&B asked to put this one in) a site dedicated to dog-lovers passionate about creativity, covering art, architecture, fashion, travel and lifestyle. Also producing a mag that arrives in the coolest brown envelope stamped with a massive woof, now that can't but put a smile on your face. I recently ordered Spaces Volume 2, another swoon worthy, design envy tome from the guys at Frankie Mag that lets you surf through the homes of Australian creative folk. Frankie Mag is a bit like Kinfolk or Four&Sons— arty stuff but minus the dogs. On a final note but still in Oz, the posts from beauty blogger, author, editor and all time funny gal Zoe Foster are very witty and worth a gander to make you smile. //2. it is you know, absolutely no kidding. Its the online site of a concept store in Belgium from which I have picked up a number of pieces for projects but apart from an extra long cheese board as a bath caddy, I was waiting to buy some cool pieces for myself. A current bedroom revamp from the rich hue of F&B London Clay to a lighter Scandie vibe has afforded me the opportunity to restyle the room and I got some gorgeous new accessories that arrived today. Once I finish the painting and the labourious task of distressing the shutters — paint, wax, paint wax, sand, wax more, run out of wax — I'll take a pic, but for now a sneaky shot of some of the bits that arrrived!